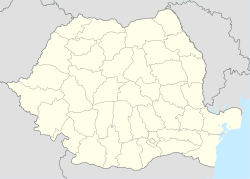 For the former administrative subdivision of Romania, see Turda County. For the village in Tulcea County, see Mihai Bravu, Tulcea. Turda (Romanian pronunciation: [ˈturda]; German: Thorenburg; Hungarian: Torda; Latin: Potaissa) is a city and Municipality in Cluj County, Romania, situated on the Arieș River. There is evidence of human settlement in the area dating to the Middle Paleolithic, some 60,000 years ago. The Dacians established a town that Ptolemy in his Geography calls Patreuissa, which is probably a corruption of Patavissa or Potaissa, the latter being more common. It was conquered by the Romans, who kept the name Potaissa, between AD 101 and 106, during the rule of Trajan, together with parts of Decebal's Dacia. The name Potaissa is first recorded on a Roman milliarium discovered in 1758 in the nearby Aiton commune. Milliarium of Aiton is an ancient Roman milestone dating from 108 AD, shortly after the Roman conquest of Dacia, and showing the construction of the road from Potaissa to Napoca, by demand of the Emperor Trajan. It indicates the distance of 10,000 feet (3,000 m) (P.M.X.) to Potaissa. This is the first epigraphical attestation of the settlements of Potaissa and Napoca in Roman Dacia. The complete inscription is: "Imp(erator)/ Caesar Nerva/ Traianus Aug(ustus)/ Germ(anicus) Dacicus/ pontif(ex) maxim(us)/ (sic) pot(estate) XII co(n)s(ul) V/ imp(erator) VI p(ater) p(atriae) fecit/ per coh(ortem) I Fl(aviam) Vlp(iam)/ Hisp(anam) mil(liariam) c(ivium) R(omanorum) eq(uitatam)/ a Potaissa Napo/cam / m(ilia) p(assuum) X". It was recorded in the Corpus Inscriptionum Latinarum, vol.III, the 1627, Berlin, 1863. This milliarium is an attestation of the road known to be built by Cohors I Hispanorum miliaria. The castrum established was named Potaissa too and became a municipium, then a colonia. Potaissa was the basecamp of the Legio V Macedonica from 166 to 274. The Potaissa salt mines were worked in the area since prehistoric times. After the Hungarian conquest, the Turda salt mines were first mentioned in 1075. They were closed in 1932 but have recently been reopened for tourism. Saxons settled in the area in the 11th century. The town was destroyed during the Tartar invasion in 1241–1242. Andrew III of Hungary gave royal privileges to the settlement. These privileges were later confirmed by the Angevins of Hungary. The Hungarian Diet was held here in 1467, by Matthias Corvinus. Later, in the 16th century, Turda was often the residence of the Transylvanian Diet, too. The 1558 Diet of Turda declared free practice of both the Catholic and Lutheran religions. In 1563 the Diet also accepted the Calvinist religion, and in 1568 it extended freedom to all religions, declaring that "It is not allowed to anybody to intimidate anybody with captivity or expelling for his religion" – a freedom unusual in medieval Europe. This Edict of Turda is the first attempt at legislating general religious freedom in Christian Europe (though its legal effectiveness was limited). In 1609 Gabriel Báthori granted new privileges to Turda. These were confirmed later by Gabriel Bethlen. In the battle of Turda, Ahmed Pasha defeated George II Rákóczi in 1659. In 1918, Transylvania was absorbed by Romania, and Turda with it. In 1944, the Battle of Turda took place here, between German and Hungarian forces on one side and Soviet and Romanian forces on the other. It was the largest battle fought in Transylvania during World War II. Turda has a continental climate, characterised by warm dry summers and cold winters. The climate is influenced by the city's proximity to the Apuseni Mountains, as well as by urbanisation. Some West-Atlantic influences are present during winter and autumn. Winter temperatures are often below 0 °C (32 °F), even though they rarely drop below −10 °C (14 °F). On average, snow covers the ground for 65 days each winter. In summer, the average temperature is approximately 18 °C (64 °F) (the average for July and August), despite the fact that temperatures sometimes reach 35 °C (95 °F) to 40 °C (104 °F) in mid-summer in the city centre. Although average precipitation and humidity during summer is low, there are infrequent yet heavy and often violent storms. During spring and autumn, temperatures vary between 13 °C (55 °F) to 18 °C (64 °F), and precipitation during this time tends to be higher than in summer, with more frequent yet milder periods of rain. According to the last Romanian census from 2011 there were 47,744 people living within the city. Of this population, 84.7% are ethnic Romanians, while 8.98% are ethnic Hungarians, 6.03% ethnic Roma and 0.4% others. ^ "Population at 20 October 2011" (in Romanian). INSSE. January 2014. Retrieved August 20, 2015. ^ "ARCHAEOLOGICAL REPERTORY OF ROMANIA. Archive Of The Vasile Parvan Institute Of Archaeology – Site Location Index". Retrieved September 20, 2014. ^ "Structura Etno-demografică a României". Edrc.ro. Retrieved October 8, 2017. "INP - Museums and Collections in Romania". Cimec.ro. Retrieved October 8, 2017. "Turda - Romania". Britannica.com. Retrieved October 8, 2017. Wikimedia Commons has media related to Turda.